I purchased Imperial Assault as soon as it hit the shelves in December 2014, and have been furiously painting up the miniatures ever since. After 2 months of work, I've painted 33 of the 36 miniatures in the box. The miniatures in Imperial Assault are well worth the effort. They are sculpted by Benjamin Maillet with Jason Beaudoin, Gordon Robb and Nick Miller. Maillet and his team have gone for a lifelike look with realistically proportioned limbs. In this sense, they remind me of the Lord of the Rings figures sculpted by the Perry Brothers for Games Workshop -- a style of miniature very different from the "heroic" style common to Warhammer. From foot to eye, the Star Wars minis average about 32 mm, although some figures (Wookies, Darth Vader) are much bigger. This variation in height is satisfying, giving some models a feeling of strength. Maillet's particular talent is capturing the personality of the characters in dynamic poses... so young Luke Skywalker seems almost afraid of his over-sized blaster, while Darth Vader's forward step lends him menace and power. My only complaint is that the miniatures are made of medium-hard plastic (urethane? ), rather than the rigid polystyrene used by Games Workshop. This is a pity: the softer plastic can lose some detail, especially in the faces. It also leaves a serious modeler with some problems: the molding lines on the miniatures can be quite pronounced, and require care to remove, since sanding this material doesn't work (files shred the plastic into a rough fringe rather than a smooth surface). Also, thinner pieces of the miniature (like lightsabers) are very bendy -- to harden these bits and keep the paint from cracking off them over time, I covered them in layers of white glue and water (50:50 mix). Finally, because the plastic is quite light, I had to improve the figures' stability. So I glued 1/4 x 1" stainless steel washers to the bottom of each plastic base. Happily, these washers are almost a perfect fit with the miniatures' built in round base. If these figures were just board game pieces, I could forgive the cheap plastic. But Fantasy Flight is contractually obligated to make Imperial Assault a miniature war game since they don't have the rights to Star Wars board games. Indeed, there is a rumour (picked up from my local gaming store) that Hasbro (who does own the board game license) has been jousting with Fantasy Flight over whether Imperial Assault is a war game at all (after all, Imperial Assault bears a striking resemblance to Fantasy Flight's fantasy board game Descent). My view is that if these models are truly war games miniatures, they should be made out of war game grade material: durable urethane, resin or white metal. But in the grand scheme of things, this is a just a quibble. Notwithstanding the soft plastic, the miniatures carry a lot of texture and detail (at least in their uniforms and weapons). I love the realistic sculpting style. They models have character and an authentic Star Wars feel. In sum: highly recommended! Stay tuned for my next post, when I talk about painting these miniatures. 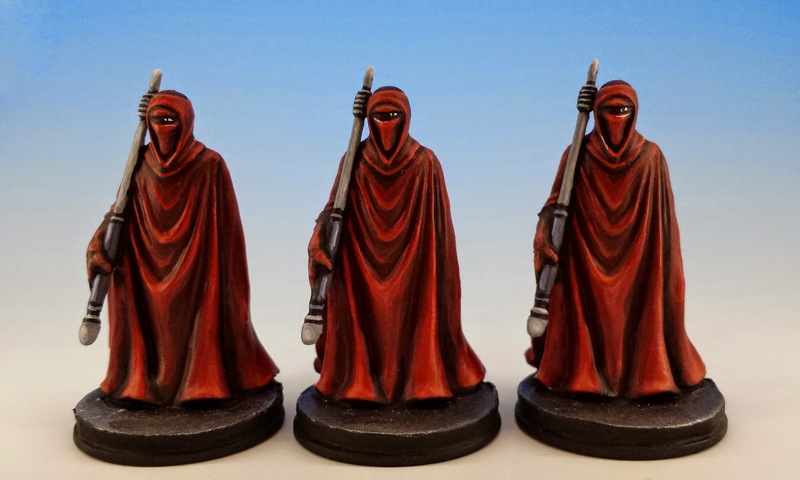 If you're interested in Star Wars and the influence of Lucas on Warhammer, there have been a couple great posts by other writers/gamers following up on my musings: check out Tiny Basement's article on Storm Troopers & Space Marines and Private W.'s photography of his amazing collection of Star Wars Miniatures from Wizards of the Coast. I have a fair collection of the juvenile monstrosities from WoTC. Bought to play star wars with my sons they are OK and paint up well. I considered buying this when it came out to add to my stash but was concerned over how they would mix and over the lack of rebel troopers. What I'd really like to see is someone produce affordable vehicles in a usable scale. I'd love some sand skiffs for example. I couldn't agree more about the vehicles... and its one thing that does give me pause in Imperial Assault. Fantasy Flight seems to have take a more interior-map-based approach with this game (it is like Advanced Heroquest with lasers). This has some real advantages (compact playing areas with some beautifully illustrated map tiles) but it is hard to see them putting much emphasis on vehicles.... I may even try to scratch build some. Beautiful work on those minis. I have an eye on this game, but haven't purchased it yet. Having a look at your pics makes me want it immediately!! Thanks Suber! If you paint any of the miniatures up, please let me know - I'd love to see what you do with them. Lovely work. The Imperial Red Guard are the coolest Star Wars troops, well them and the snowtroopers. I love the rich red you used. Gorgeous paint jobs sully really. I had a hope that they would be compatible with west end games older stuff but some things I guess are not meant to be. Can't wait for a chance to see them in person! I have a bad feeling that the West End Games minis are on a much smaller scale (I've only looked at pictures of them... I don't own any myself). 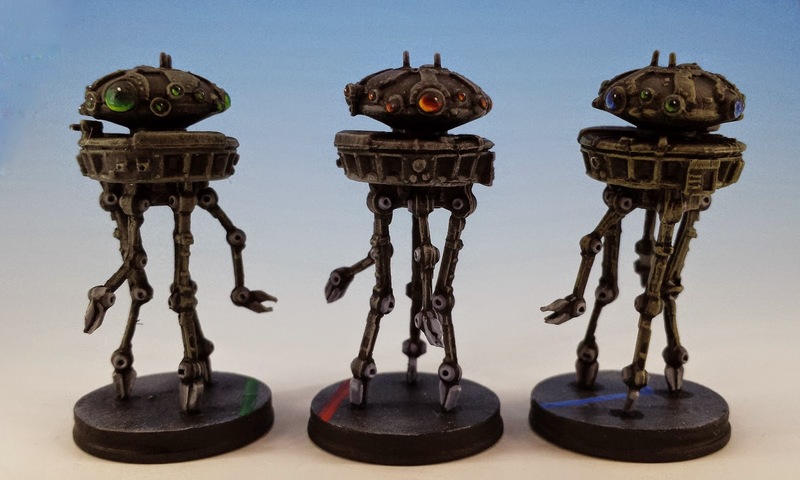 The Imperial Assault minis are on a slightly larger scale than Warhammer minis - although I think they would be roughly compatible if you were doing a science fiction mash-up. I got some of Jabba's gang and the Cantina band from West End Games, WotC didn't produce the goods for this. The Aliens fit as being slight isn't a terrible thing. The only human I have in Lando disguised as one of Jabba's guards. He is small but nicely based I could live with it. Nicely painted figs! And I shared your excitement when I first heard the news about the release of Imperial Assault, although I found that I was disappointed when I finally encountered the minis. Like Erny, I have a large collection of the WOTC "juvenile monstrosities" originally bought to indulge and share a Star Wars passion with my son. But the more we played with these figures and the more we collected them, the more I fell in love with them. In many ways the WOTC figs remind me of the wonder that was Britain's Deetails toy soldiers that I grew up with and loved. Plus the WOTC range is huge and there are quite few truly dynamic and wonderful action poses. Anyway, I just wanted to throw down a positive word for the WOTC guys. Who knows, one day you might even want to bulk out your Imperial Assault collection with a few great WOTC figs. I probably shouldn't trash talk WOTC's Star Wars Miniatures since I don't own any and have only looked at pictures of them. So your point is well taken. And the range of minis does look fantastic. Sometimes the oddest miniatures can really capture a magic that even the best sculpted miniatures can't. For me, the best example of this is Heritage's line of sci-fi miniatures for Galacta 25. This was a SHAMELESS copy of Star Wars done sometime around the early 1980's. Some of the sculpts were OK, some were awful -- but they all had a certain quality that I still love to this day. Too bad they're quite rare now. Rare, but not expensive. Don't worry about the "trash talk", it just made me all eager to go get out some of my figs and enjoy a couple of minutes with them. I posted a few pics up on my blog inspired by my visit here. And thanks for the tip about the Heritage sci-fi line. I must check them out. First, thanks for showcasing what me and many others were thinking the first time we saw the Imperial Assault ads - "How do the mini's paint up?" I have two of the D&D boardgames (Ravenloft and Ashardalon) and it looks like the quality of the minis is the same. Good for gameplay, bit of a mixed bag for painting up. 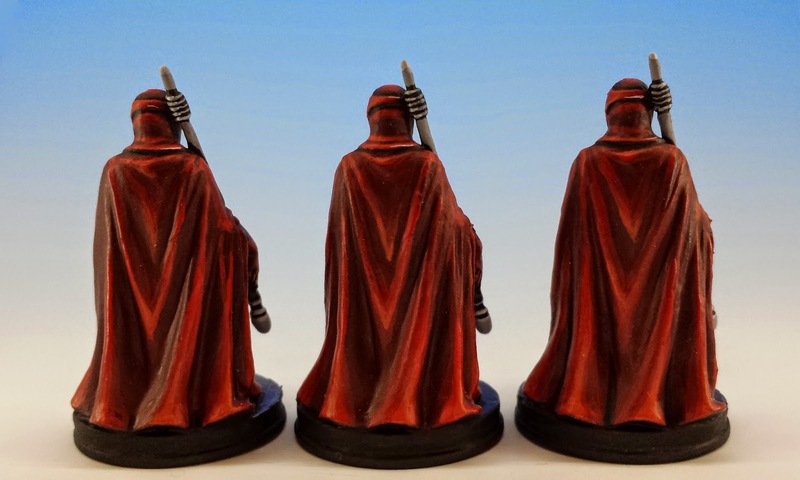 That said, the red on your Emperor's Guards is amazing! You need to do a short tutorial on that peice alone! 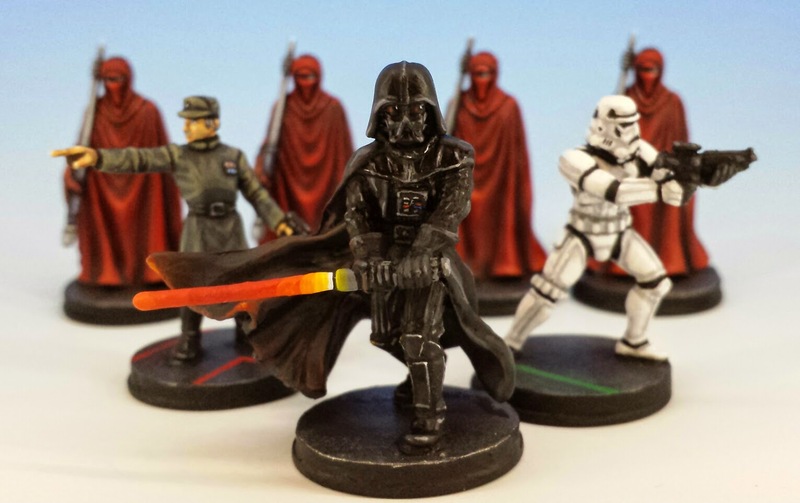 If you haven't seen them already, check out Private W.'s shots of his vast collection of WOTC's Star Wars Miniatures. His photography is totally cinematic and the figs look grand in massed array. Hey, Matthew, thanks for the nice words and the "link-out"! I've been helping a friend get started with his set and they're great for beginners. You've made an amazing job of yours - love the glow of the light-sabre and those Imperial Guard! However, I share your sentiment regarding the material they're constructed from, would be so much better if it were a little more rigid - those mould lines are awful to deal with. Pretty sure it's the same thing that the Drizzt box-set figures are made of. 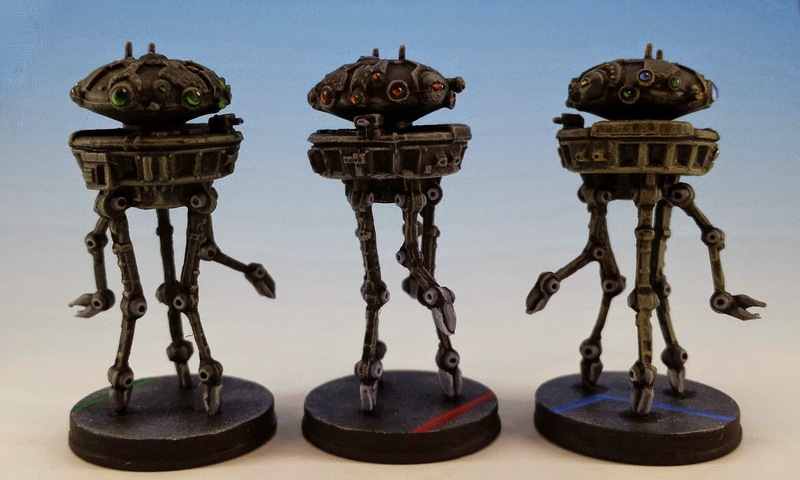 "My view is that if these models are truly war games miniatures, they should be made out of war game grade material: durable urethane, resin or white metal." Plenty of historical wargamers use the medium/soft plastic of Airfix, Revell or Italeri. The hard plastic is only standard in sci-fi and fantasy because of GW's influence. That's a good point. But I still prefer a harder plastic that has more durability and picks up detail a little better. It seems to me that if FFG wants to attract serious miniature war-gamers, top-quality sculpts would be a good place to start.